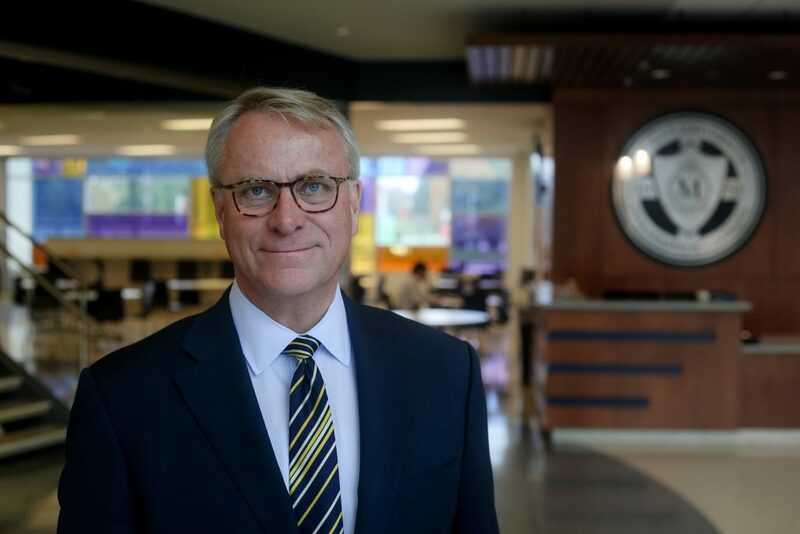 INDIANAPOLIS — During the most recent meeting of the Marian University board of trustees, a unanimous vote was cast to extend the contract of President Daniel J. Elsener through the 2024-25 academic year, university officials announced today. The length of the contract coincides with the university’s Strategic Plan 2025, which was unveiled in fall 2015. President Elsener joined Marian University as its eighth president in August 2001. His academic preparation, professional experience as a lifelong educator, and leadership in community and national efforts have been a great benefit to Marian University, Indianapolis, and beyond. His life in educational leadership began with a bachelor’s degree in political science from Nebraska Wesleyan University, followed by a master’s degree in education administration from the University of Nebraska and further graduate studies at Kansas State University, Washburn University, Wichita State University, Kansas Newman University, and St. Meinrad. Prior to serving at Marian University, Elsener served as a teacher, high school principal, superintendent of Catholic Schools for the Diocese of Wichita in Kansas, Secretary/Superintendent of Catholic Education for the Archdiocese of Indianapolis, and Executive Director of the Christel DeHaan Family Foundation. During President Elsener’s tenure, Marian University has achieved tremendous growth. Marian currently serves the largest enrollment in the university’s history, with 4,400 students from 40 states and 34 nations served in the 2018-19 academic year. In 2013, Marian University opened its College of Osteopathic Medicine, just the second medical school in Indiana and the first to open in the state in 110 years. Fueled by a powerful vision of forming transformational leaders for service to the world, Marian University has been nationally recognized as one of the fastest-growing colleges and universities in America. This leadership vision is providing an exceptional education to the university’s students, bringing innovations to the critical professions of healthcare, education, business, ministry, and also the larger wellbeing of the community and economy. The campus has been transformed over Elsener’s time as president, with many bold initiatives and new buildings being constructed to accommodate these dynamic programs and the burgeoning student population, including facilities for health sciences, business, a student center, dining commons, graduate student apartments, a fitness center, and an arena/convocation center. The university recently launched a daring move to raise the impact of the successful Marian University School of Education to national prominence. The Klipsch Educators College is at the forefront of innovation in recruiting and developing exceptionally talented educators for service to K-12 schools. And Marian has also achieved success in athletics during President Elsener’s term, including the creation of a football program that played in three NAIA national championships in its first 10 years, winning twice. President Elsener’s vision for enhancing Marian University’s ability to serve its students and community will continue to expand in the coming years. This summer, Marian, with the help of the Saint Joseph’s College Rensselaer community, philanthropists, and businesses, will open a groundbreaking new two-year college, branded Saint Joseph’s College of Marian University – Indianapolis. Later in 2019, Marian will open the Walker Center for Applied Ethics with the vital mission of advancing a more ethical world by improving and evolving the interdisciplinary teaching of ethics and by bridging the gap between research and organizational best practices. Elsener will also focus efforts on financing the Sisters’ Legacy Fund, which will contribute mightily to the support of Marian’s founders, the Sisters of St. Francis Oldenburg, and the faith values and deep sense of mission that laid the foundation for the current success of Marian University. Founded in 1937, Marian University is proud to be the only Catholic university in Indianapolis and central Indiana. In 2018-19, Marian is serving 2,400 undergraduate and 1,160 graduate students earning degrees in the arts, business, education, engineering, math, medicine, nursing, ministry, and the natural and physical sciences. The university’s high-impact, experiential curriculum is designed to provide hands-on, collaborative learning opportunities for students from 45 states and 23 nations. Marian climbed in U.S. News & World Report’s 2019 Midwestern rankings to be named #10 Most Innovative Regional University, #24 Best Value University, and #38 Best Regional University. Marian University opened its College of Osteopathic Medicine in 2013, making it the first new school of medicine in the state of Indiana in over 110 years. Marian’s national champion varsity athletic programs include the 2012 and 2015 NAIA Football National Championship, the 2016 and 2017 NAIA Women’s Basketball Championship, and more than 40 USA Cycling national championships.